UFO fans can be a danger to society. I won't go as far as to endorse Philip Klass' book UFOs: A Dangerous Game, but I will say that in some circumstances, ardent UFO buffs can be a serious problem. I received another message overnight from a rather uncritical UFO fan. I've heard from him before; he sees UFOs (READ: lights moving in the sky) fairly often and sends me his notes on observations. He's shown uncompromisingly poor judgement in his pursuit. He sees dozens of UFOs nearly every time he goes out skywatching, often in the middle of a populated area with many lights and with significant light pollution, and usually near flight paths leading towards airports. In addition, he sometimes sends me links to Beforeitsnews and some other hoax sites raving about how great they are. In general, I didn't really think this kind of UFO fan caused any serious problems. They're annoying, but tolerable. And a bit embarrassing to serious ufology. But last night's message gave me concern. "Friday night was a goodnight for U.F.O hunting. From 11pm to 3am i saw 2 U.F.O's They had red and white lights on the corners shaped like a triangle or a boomerang object i could see it in my binoculars. The 1st one came straight down on the right side over the farmers yard light. Than it hovered slowly left over the trees. 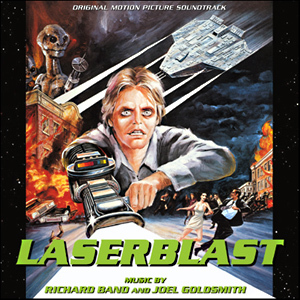 When i signaled it with the lazor pointer and the flash light it signaled me back with a brighter white light. Those 2 U.F.O's came back and forth over the hrs I was watching them. A perfect night in Tyndall for U.F.O hunting calm, clear and no wind out." Yes, that's right. He's using a "lazor" pointer to shine at the UFOs he's seeing... which are obviously aircraft! So now, he's endangering human life! What do we do? He will not believe me that it's an aircraft. he's convinced everything he sees is an alien ship. He's not the first one, of course. A good pair of binoculars is useful for viewing aerial or otherwise distant phenomena, and a laser pointer is helpful both for signaling and for pointing out objects when working in a group although should use should be minimized. So what should dedicated ufological researchers do with such individuals? Most will not accept the possibility they have been only observing aircraft. The lights seen by Greer on a CSETI expedition to Florida several years ago (and which were likely a Search-and-Rescue operation) have been held up as definite contact with aliens by his adherents. And the fellow who contacted me has never been swayed by my suggesting his many UFO sightings were not of alien spacecraft. If only those aliens would stop disguising their saucers as terrestrial aircraft. 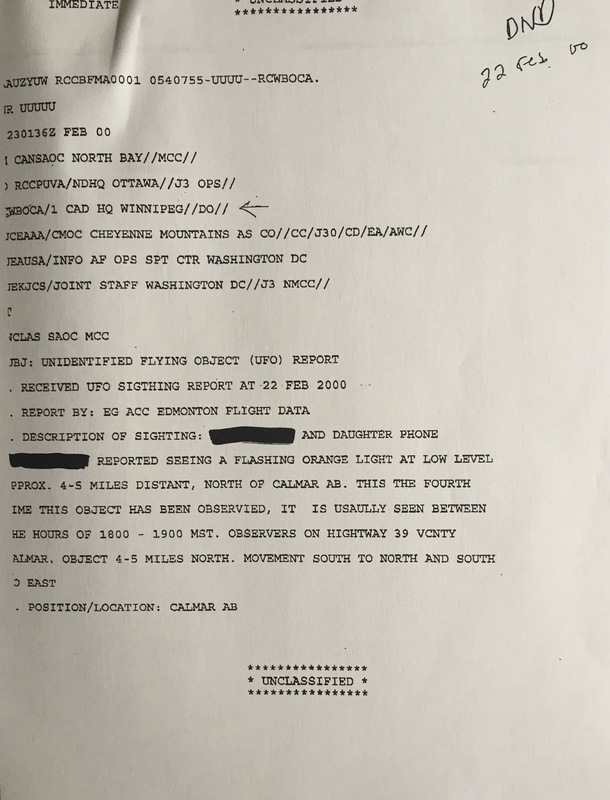 Recently, a lot of media and net attention was given to an announcement that classified UFO documents relating to objects tracked by NORAD had been obtained by a Canadian researcher at great personal risk. 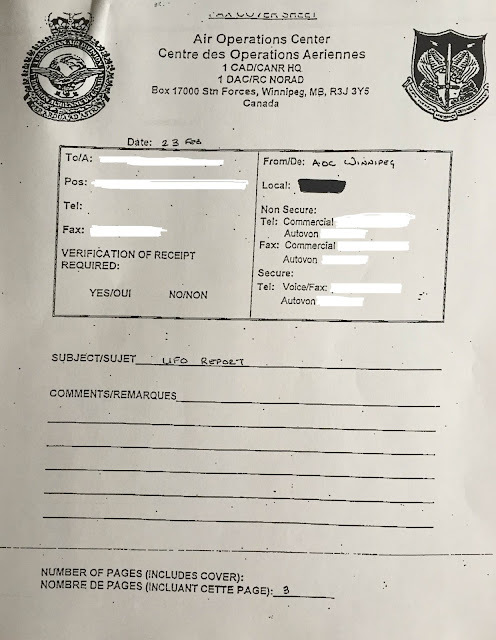 This was heralded and hyped as quite the breakthrough, showing that the government and military are deeply concerned about UFOs and alien spacecraft, and that this is proof that Disclosure must be demanded by concerned citizens, especially UFO fans. Courageous! Amazing! Fantastic! Except that the documents in question have been available online for years. Even I have some copies that I've had for awhile. Dean includes copies of official Canadian documents where NORAD was involved with UFO sightings. ... and he's continuing his research, with more to come. 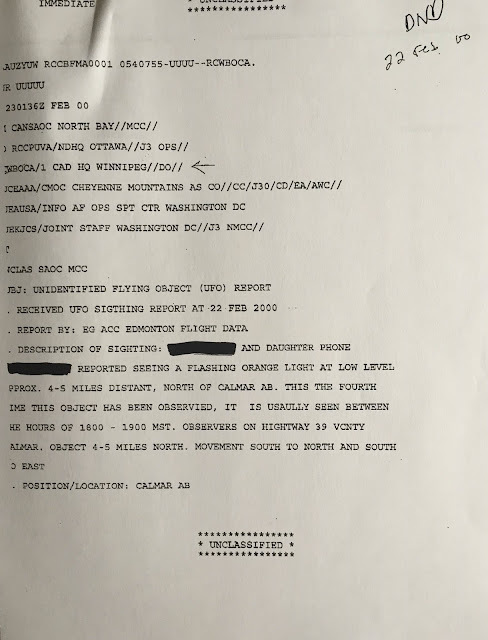 In addition, Palmiro Campagna, whose book The UFO Files: The Canadian Connection Exposed describes government and military involvement in the subject, also features the NORAD documentation. "Many of the older documents shown, including the blurred out one were published or discussed in my book The UFO Files: The Canadian Connection Exposed, published back in 1997 and republished in 2010. In fact in the blurred out document you can still make out my caption as it is a straight photocopy from my book." In other words, the documents were nothing new to dedicated UFO researchers, but they were astonishing to newcomers to the field. That doesn't excuse longtime researchers who were present at the time of the public announcement, however, who probably should have spoken up. 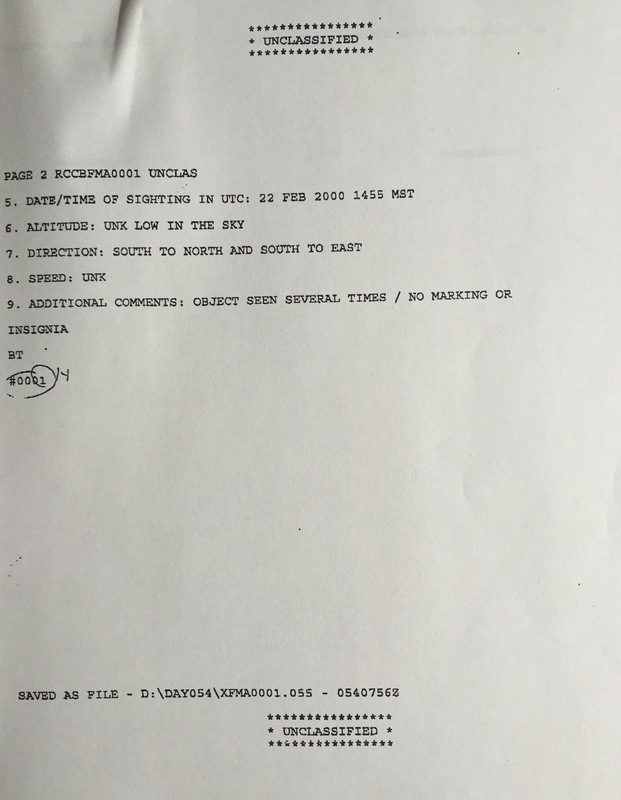 At any rate, I thought I would add to the hoopla by posting some hitherto unpublished NORAD documents relating to UFOs. And in this instance, the military air traffic controllers saw the object but were unable to determine what it was. I'm not suggesting these were spacecraft or anything otherworldly. I'm simply showing that there are other documents of this nature. It's unlikely that I or Campagna or Dean will be given medals for this work.